Short review/gameplay/news post for this DLC for Pinball FX2, with the table now out there if you like what you see in the below video.With my few times playing the table (the video being my first game on it) it's easy to see that once again Zen Studios have done a great job with a much-loved franchise. Playing it the few times I have, it certainly seems one of the more compact tables I've played in recent times, but that doesn't stop it offering frantic action when trying to score high on those leaderboards. The table itself offers 10 story-related game modes, with each one of those having its own set of playfield toys and goals. 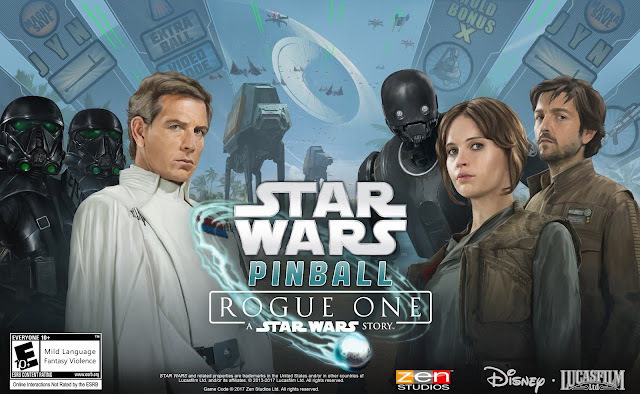 You can expect things such as having to avoid stormtrooper detection in stealth missions, holding your own in firefights and combat missions and facing off against Director Krennic and his Death Troopers in a white-knuckle multiball mode (thanks press release for helping this Star Wars noob out). Hard to review a pinball table in truth, so just check out the below gameplay and see if you fancy paying the £3.19 asking price it has here in the UK.